In October 2011 I finally received my Gohonzon from the SGI-UK (Soka Gakkai International) – a lay Buddhist organisation dedicated to peace and the creation of value in people’s lives. It took me twenty years for reasons too long to go into here, suffice to say it was a great day. 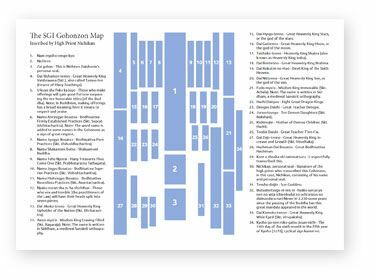 As a little aid to memory, and to help in my study, I have created a printable Gohonzon Diagram of the Nichikan Gohonzon the SGI confers upon members -This Gohonzon was originally inscribed by high priest Nichikan in 1720. I hope you find it useful. Thanks Steve, really helpful as I’m preparing next month’s Basics on The Gohonzon. Have a great day! Thanks Emma… I know this kind of thing is available on the web, but I thought a handy printable PDF would be handy 🙂 have a great week. Thank you so much for this! I just want to make one slight correction. #34, the date should be 1720, not 1270. 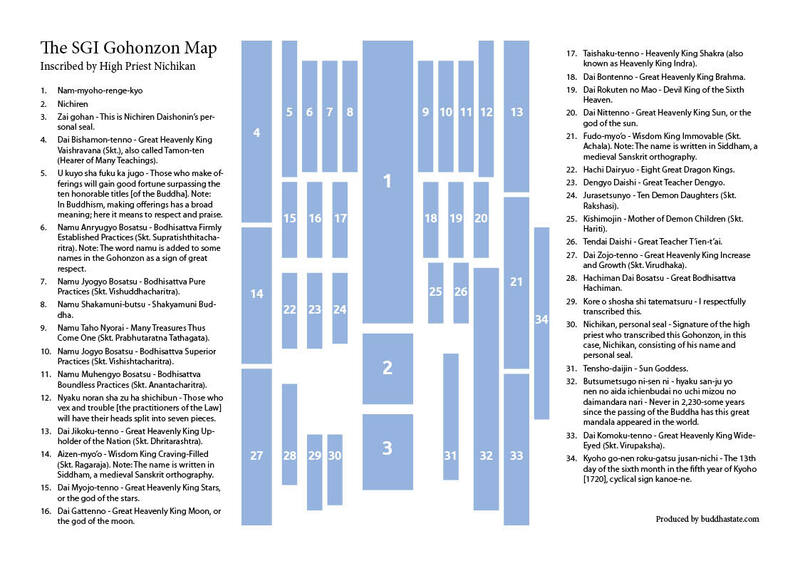 A few Gohonzons were printed before 1279. Nichikan existed in 1720, not 1270. Thank you! You know of course that Nichikan Shonin’s gohonzon (the original) was a transcription of the Dai-Gohonzon and that Nichikan Shonin’s dedication inscription has been edited off of your copy and that Nichikan Shonin remained true to the Dai-Gohonzon throughout his life? And that SGI has now decided to abandon and repudiate the Dai-Gohonzon? You know that; right? My (limited) understanding is that the Dai-Gohonzon was moved by the Priests before the Sho-Hondo was demolished, and placed in a new (at least different) building. The Dai-Gohonzon was not abandoned, just made unavailable to any non-Nichiren-shu (or simply put) SGI members. Let me state again that is my limited understanding.